↑ "Whitney Houston". Filmbug. January 1, 2000. http://www.filmbug.com/db/308। আহৰণ কৰা হৈছে: January 2, 2012. ↑ "WHITNEY – The Producer". Whitney-Info.Com. http://www.whitney-info.com/whitney-the-producer/। আহৰণ কৰা হৈছে: January 2, 2012. ↑ "Whitney Houston biography". whitneyhouston.com. August 19, 2009. http://www.whitneyhouston.com/us/content/biography। আহৰণ কৰা হৈছে: November 22, 2010. ↑ Dobuzinskis, Alex (September 15, 2009). "Whitney Houston, as of 2009, said she was "drug-free"". Reuters. http://www.reuters.com/article/entertainmentNews/idUSTRE58D4Y020090915। আহৰণ কৰা হৈছে: January 13, 2010. ↑ "Whitney Houston Biography". whitneyhouston.com. 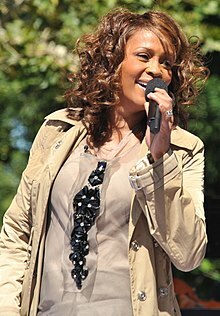 http://www.whitneyhouston.com/us/biography। আহৰণ কৰা হৈছে: January 12, 2010. ↑ "Whitney Houston Sings Her Way to Stardom with Hit Album, Road Tour". Jet (Johnson Publishing Company) খণ্ড 68 (24): 59. August 26, 1985. ISSN 0021-5996. http://books.google.com/books?id=prQDAAAAMBAJ&lpg=PA58&dq=whitney%20houston&pg=PA58#v=onepage&q&f=false। আহৰণ কৰা হৈছে: February 7, 2011. ↑ "Whitney Houston, 48, found dead in Beverly Hills". Los Angeles Times. February 11, 2012. http://latimesblogs.latimes.com/lanow/2012/02/whitney-houston-dead-beverly-hills.html। আহৰণ কৰা হৈছে: February 11, 2012. Whitney Houston (March 1999). My love is your love: piano, vocal, chords. Alfred Publishing Co., Inc.. ISBN 978-0-7692-7734-9. Kevin Ammons (April 1998). Good Girl, Bad Girl: An Insider's Biography of Whitney Houston. Carol Pub Group. ISBN 978-0-8065-8012-8. Jeffery Bowman (February 1995). Diva: the totally unauthorized biography of Whitney Houston. Harper. ISBN 978-0-06-100853-5. Ted Cox (January 1998). Whitney Houston (Black Americans of Achievement). Chelsea House Publishers. ISBN 978-0-7910-4456-8. Craig Halstead (September 2010). Whitney Houston: For the Record. Authors OnLine, Limited. ISBN 978-0-7552-1278-1. James Robert Parish (September 2003). Whitney Houston: The Unauthorized Biography. Aurum Press. ISBN 978-1-85410-921-7. James Robert Parish (April 2010). Whitney Houston: Return of the Diva. John Blake. ISBN 978-1-84454-919-1.